Total database frequency architecture and statistics amount to over 30 kinds of books and 48,030 entries. There are more than 1,500 idioms of the same origin whose usage is worth referring to, a total of over 5,000 entries. 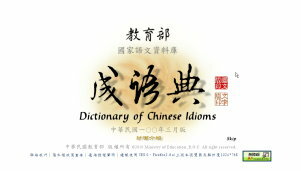 Combined with the idiomatic information contained in the Revised Dictionary of Chinese Idioms and other information in the appendix, a total of 23,385 entries, the book contains more than 28,000 entries of idioms. Each entry includes expatiation, original text of allusion, annotation, description of allusion, reference, usage (including present-day illustrative sentences), identification, and reference terms. Idioms of films and novels, idiom application little stories, idiom relay, text auxiliary database, and terms for social occasions. Vivid, flowing search screens enhance learning effect. Aid the rhetoric need of speech and writing by employing classification of natural language concept. Creative ways to search English words, providing foreigners with a convenient way to learn Chinese.